The Academy Awards are the highlight of the year of cinephiles. It's when the Academy honors those they see as the absolute best of the best. To even receive a nomination is a staggering accomplishment. Naturally, when the stakes are that high, and you're up on the stage accepting the award... you may not be thinking clearly. For those poor people it's traumatic, for viewers at home it's a moment to relive on YouTube forever. Most of these weird oscar acceptance speeches had only the best intentions. Whether they decided to go too political; to express a deep, deep love for a family member; or to quote the movie for which they won, it surely all sounded good in their heads. These Oscar speech fails come from some of the best and brightest in the industry - after all, everyone has an off day. Leo managed to make interacting with Kirk Douglas, who presented the category, feel even stranger than it already was. Then she dropped an F-bomb and rambled for what felt like hours. To close, she went with some weird yelling about selling motion pictures. To top it all off she took Kirk Douglas's cane and acted like an old lady. Angelina Jolie brought her brother to the Academy Awards as her date. Cute right? Well... It would have been but she opened up her speech with, "I'm so in love with my brother right now." Not "I love my brother"; she's "IN LOVE" with her brother. Bet you didn't think Best Documentary Short would get a mention on this list, but it's not often someone gets full on Kanye'd at the Oscars! Director Roger Ross Williams was off to a great start, when he was joined on stage by his very own producer, Elinor Burkett (with whom he shared the award). 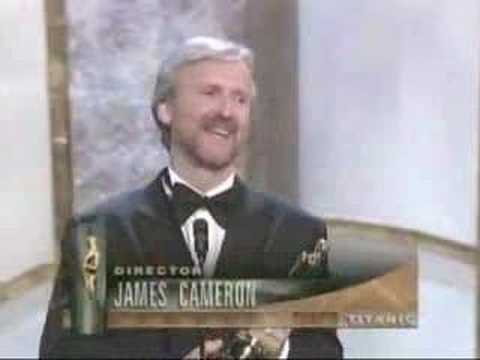 James Cameron's speech opens with the same general thanks and fanfare. There's even a great joke about his parents being his "original producers." He's doing a decent, if slightly boring, job until the end, when he loudly and awkwardly announces he's the "KING OF THE WORLD!" then starts wooing and yelling but with weirdly dull eyes.